I guess everyone involved in Chinatown affairs has an opinion on whether Chinatown should build a gateway arch. I guess knowing a few of those opinions is a sure mark of contact with Chinatown discussions. Perhaps there already is a gateway arch in Chinatown. It is intellectual and interactive, and you don't know that you have walked through it until you find yourself on the other side of it. Chinatown's gateway arch is a discussion: the discussion of the arch. Once you find that you have an opinion on it, you suddenly discover that you've walked into a place you hadn't been before, or if you'd been, you hadn't quite seen it from this angle. Of the proposals I've heard, one of Wellington Chen's is most appealing and smartest: a hologram arch. It would create a tourist attraction that will draw commerce to Chinatown, won't consume space and could even span the entirety of Chinatown itself, encompassing all its locations. I can imagine that such a hologram arch -- maybe even a transforming hologram taking traditional features and melding into modern features in turn melding into futuristic possibilities, with elements drawn from the whole immigrant history of Chinatown: African, German, Irish, Jewish and Italian -- I can imagine that as a worldwide tourist attraction. It would be a financial bonanza for Chinatown, feeding cash every day in perpetuity, like the Eiffel Tower, as Wellington likes to say. It's an irresistible proposal. But I have qualms about tourism. It's not monolithic, tourism. Tourists who come to Chinatown for Chinatown's authentic living character are different from tourists who come to see an urban technological marvel. The latter expect to eat American fare, preferably MacDonalds, but Wendy's will do too. They might venture into a local restaurant, but only if the menu isn't too threatening. I'm fine with Empire State Building tourists at the Empire State Building, or Statue of Liberty tourists at the ferry -- there are no neighborhoods to destroy there. Chinatown has to consider which tourists it wants and how to get them. If the goal is to attract tourists to Chinatown for its authentic living character, and not for a convenient concentration of MacDonaldses and Wendy'ses and a handful of Americanized "Chinese" restaurants, why have any arch at all? How does an arch enhance the lived character of the place? I feel the lack of a symbol for Manhattan's Chinatown. Is there one? Its landmarks are urban and American -- rows of tenements built for Irish, Italians and Jews, a park with a Calvert Vaux pavilion, a bridge entry with a grand and grimy Beaux Arts Carrere & Hastings entrance, a bank designed to match the classical Beaux Arts bridge, minus the grime. There's Confucius and there's Lin Ze Xu, but neither one is specifically Manhattan's Chinatown nor expresses the relation of Chinatown to Manhattan. Kim Lau comes closer and should be better known, but to try to make it better known would be a task akin to lecturing a class of students who just want to get out and play. 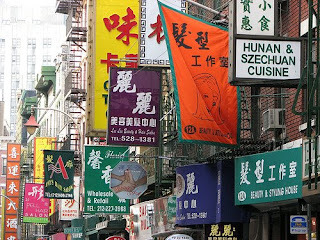 The most distinctive image of Chinatown for me is the bright chaos of flying banners posted along Pell Street. They are a favorite among photographers. Flickr is rife with Pell Street shots. Go look. It says so much about Chinatown: that it is lively, busy, commercial, bright, welcoming, distinct from the rest of the city yet distinctively urban and New York in character. All the most memorable images of Chinatown are of its streets and streetlife. It has no Chrysler Building, or Upper West Side grand hotels or Upper East Side marble museums, or East Village Tower of Toys (and now the EV has lost that too) or lamppost mosaics, or Greenwich Village townhouses. It does have roast ducks in picture windows, sunday-in-the-park ensembles of erhu, flute and yangqin surrounded by trees, their low branches hung with the cages of exotic song birds, and a narrow, winding street dour in its presence and darker in its past. The discussion of the arch seems like a red herring to me. The image of Chinatown surely should be sought in what Chinatown is, not in creating what it isn't or conforming it to other places. If character shall be destiny, that creation or conformity can only lead away from the true path. But what do I know? I'm an outsider. Maybe the funds for the arch should be devoted to finding an image for Chinatown drawn from Chinatown itself. A fauvist silkscreen of Pell Street banners? The Chinatown Working Group has addressed itself well to a variety of interests and issues, but has not adequately, clearly, fully and definitively discussed the ten ton elephant in the room: there's a tension within Chinatown's future between promoting a thriving Chinatown and preserving its character; the danger of gentrifying Chinatown out of existence. Chinatown gentrification is already evident in rising commercial and residential rents. The Chinatown Working Group can help to direct gentrification, control it or increase it. A lot depends on who attends their meetings. The CWG understanding of and position with regard to gentrification is, I think, the most important first task before it. Without an unambiguous stance on gentrification, without clearing the air of the conflicting interests that have a stake in gentrification for or against, I don't see how the group can move forward coherently. (gentrified neighborhoods do not accommodate new working-class immigrants, and it is likely that the character of Chinatown immigration protects Manhattan's Chinatown from the sterility that has affected Chinatowns everywhere else in the US). The Chinatown Working Group plans to hold a Town Hall meeting on the future of Chinatown and its self-determination, hoping to attract more of the local grassroots into the process. I don't see how it'll work. If the grassroots don't attend the meetings now, which are all open and public, what will attract them to a Town Hall based on the same broad mission? People come out for specific issues that affect them. If a Town Hall addressing some such specific issue can offer steps toward problem resolution, the Working Group will acquire a following in the community. To draw the broad range of the grassroots, they'd have to hold several town halls each on a different issue, and in each case offer the hope of effective change so that attendees don't leave discouraged with the process. Finding those issues is a challenge. Alternatively, the Working Group can present a range of proposals. Proposals always spark controversy. I am afraid that if a town hall on "The Future of Chinatown and its Self-Determination" fails to attract any but the usual suspects who already attend Working Group meetings, it will serve only to discourage the Working Group itself. A sure solution: install a series of really huge, ugly pieces of temporary art in central locations where they obstruct pedestrian traffic. Place the title prominently on them: "The Future of Chinatown -- Chinatown's Self-Determination" and the sponsor: "Chinatown Working Group." Then the only problem for the town hall on Chinatown's Self-Determination will be finding a venue large enough for the crowd. Years ago my landlord placed an alarm on the door to our roof. Some recalcitrant tenant set it off three nights in a row, keeping everyone in the building up all night. I announced a tenants association meeting and got 100% attendance with only two days' notice. El Bohio (formerly P.S.64) has been closed to the public for at least seven years now. In that time it's been landmarked, its terra cotta façade has been defaced and pigeons have moved in where artists, dancers and musicians once entertained audiences. Open House New York for one weekend opens buildings and landmarks that are normally closed to the public. OHNY is looking for sites of architectural and historical significance to include in its weekend of public access. I've suggested to OHNY that they ask Gregg Singer, the owner of former P.S.64, to open its doors so the public may once again see it. I doubt Mr. Singer will oblige them, but I believe he should be asked nonetheless. Would you join me in recommending to Open House New York that the former P.S. 64 (El Bohio) be an Open House site? Let's raise the community voice together. I think it's time that the public see how much damage has been done to the interior of the building. If Mr. Singer has protected the building from harm, as the landmark law requires, then he will have nothing to hide. If he has something to hide, he will find an excuse not to open the building.